If there is one room in your house that can start to look dated before any of the others it is the kitchen. The color scheme that you originally chose might well have been the in thing when you redecorated but now only a couple of years down the line, that lime green and Wedgwood blue color choice has put a big date and time stamp on your decor that you need to change. One of the things that you need to remember about design is that it changes constantly and what can be the big must have item one month for all homeowners, can be regarded as tasteless the next. Rather than pulling the whole room apart and starting with a clean slate each time why not just update a few key pieces? This will not only ensure that your kitchen design stays on trend and always looks new, but it will also save you a lot of money in the long run. 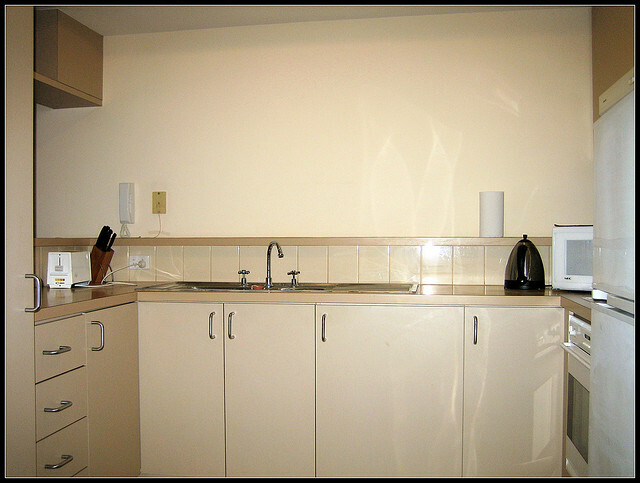 One of the easiest ways to change the way that your room looks is to change the look of the kitchen cabinets. But rather than rip them all out and fit them with the very latest in what the kitchen showrooms have to offer, leave the cabinets where they are and simply change the doors. New doors and new handles can dramatically change the way that your kitchen looks and feels but allow it to keep the same level of functionality that it has always had. Nothing tells more about how long it has been since you redecorated than your use of colour. By keeping the colour palette neutral your room will look fresher for longer, plus if you really do miss the colour you can always add splashes of colour by using tile transfers, brightly coloured table linens and tableware or by using coloured curtains or blinds, all of which are things that you can easily exchange for different colours as suits your mood. Think about the things that you hang on your walls; they could be dating your décor more than you realise. An old 1980’s clock or some really dated kitchen style prints could be dating the look of your kitchen more than you realise, so have a clear out and update the walls with something new and exciting and give your kitchen a new lease of life. Susan James writes articles on kitchen design on behalf of Glass Splashback UK.